1 of 4 Heat grill or grill pan to medium-high. Rinse tomatoes and gently pat dry. Cut each tomato into 1/4-inch-thick slices, starting from bottom of tomato. 2 of 4 Meanwhile, grill sausages for 12 to 15 minutes, turning frequently, until cooked through. 3 of 4 Place greens on a large platter. Cut mozzarella into thin slices. 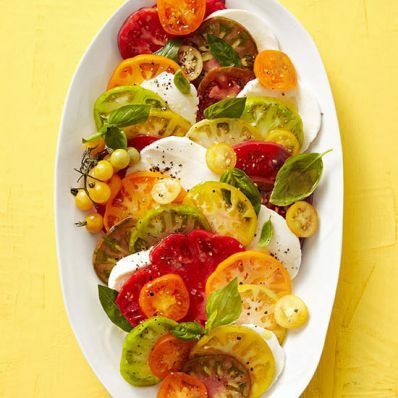 Decoratively fan tomato slices, mozzarella and basil over greens, alternating varieties of tomatoes for contrast. 4 of 4 Drizzle salad with vinegar and olive oil, and sprinkle with salt and pepper. Serve alongside grilled sausages and, if desired, Italian bread. Per Serving: 668 mg sodium, 20 g pro., 264 kcal cal., 85 mg chol., 17 g Fat, total, 7 g sat. fat, 2 g fiber, 9 g carb.